There are many items that end up on the dinner table that at one point or another are healthy for your dog and cat to eat. We are going to break down some of your favorite holiday dishes, determine ingredients that are healthy for your pup, and find the best way to share your dinner with your best furry friend. Thanksgiving dinner. We sometimes think of this holiday as being stressful - consuming too much food, having a belly ache at the end of the day and then making sure our pet doesn’t end up eating the cooked turkey carcass out of the trash. This year we are hoping you look at your turkey dinner and sous chef prepping a bit differently. There are many items that end up on the dinner table that at one point or another are healthy for your dog and cat to eat. We are going to break down some of your favorite holiday dishes, determine ingredients that are healthy for your pup, and find the best way to share your dinner with your best furry friend. Some of the main ingredients in this dish are very good for your dog. Garlic and green beans are very healthy and nutritious. Garlic should be given in small amounts but green beans are a sure winner for treats and something different for your pup to eat. If you are using fresh green beans and you snap the ends off, make sure you save those to add into your dogs next meal. Dogs aren’t partial to avoiding snapped bean ends. AVOID: Fried onions, excessive fat (bacon fat is often used in casserole type dishes) and creamed soups. These common accompaniments to green beans could all cause a belly ache, vomiting, or even acute pancreatitis - all definitely symptoms we want to avoid on busy holidays! Sweet potatoes are great for dogs when they are raw, cooked, and even dehydrated. Whether you are peeling, dicing, or slicing your sweet potatoes you can always add some to your dogs next meal. AVOID: Marshmallows and brown sugar. Our cats and dogs don’t need the added sugars. In reality, it’s even good for humans to limit their sugar intake. One more step to avoiding any digestive upset with your pet on the holiday. White potatoes are often used in grain-free kibble options for your pet. Dogs typically have no digestive issues if extra white potatoes are added into their bowl. We always recommend using organic potatoes since white potatoes are one of the highest sprayed crops with pesticides. It's better for your health and your dogs. AVOID: Most often mashed potatoes include butter, milk, garlic, cream, cream cheese, and the like, to make them creamier and tastier. Some dogs might be able to handle the extras in small amounts but it's best to avoid excessive dairy. And always avoid giving your dog potatoes topped with chives. Most homemade stuffings are made with bread, onions, garlic, celery, culinary herbs, and spices. Contrary to popular belief, dogs and cats most often do well with small amounts of garlic. Garlic is one of our favorite herbs as it does a great job at building the immune system, warding off bacterial and viral infections, as well as supporting the heart organ. It is popular in helping to rid the body of parasites as well as acting as a natural insect repellent. Both cats and dogs can safely consume small amounts of garlic. Fresh parsley is another favorite herb for pet parents to give their cats and dogs. You can simply chop it and incorporate it into your pet’s food. Dogs are more apt to eat it with kibble and not complain but you might have to be more strategic with kitties by hiding it in their canned or raw food. You should consider parsley if your pet often has an upset stomach or has chronic bad breath. When you add parsley, it also adds several vitamins and minerals in an easy bioavailable form. AVOID: Onions! Although onions and garlic are both from the allium family, they have different herbal constituents. Our modern medicine system sees them as causing the same issues upon digestion but onions are the one you should avoid. Now, don’t get me wrong, even I had my run-in with a dog eating onions when I had a counter-surfing greyhound. Onions often are based on the amount that is consumed versus the size of your dog. Small breed dogs consuming a large amount of onion could lead to Heinz body anemia. Onions should not be given. I’ve never heard of a cat trying to eat an onion so I don’t think felines would even attempt it. I would also avoid bread with your dog. Bread has gluten and wheat which can cause inflammatory conditions within the digestive system. It’s usually not harmful but it often times doesn’t leave your best friend feeling well after consumption. If you are into homemade dishes, most cranberry sauce recipes call for cranberries and oranges. Both fruits are safe for your dog. We would encourage you to set these aside and feed them without the added sugars. AVOID: Sugar. This dish most often has added sugars to balance the tart, sour cranberries. Sugar has been linked to all chronic metabolic diseases and has been known to initiate cancer growth. Let’s talk pre-cooked bird and post-cooked bird. Turkey is definitely a suitable protein for both cats and dogs. Our pets most often do best with raw, uncooked turkey as their digestive system is set up to utilize the nutrients and amino acids from the raw form. Once the turkey is cooked, you can also feed cooked pieces of the turkey meat while avoiding the skin and bones (see the avoid mentions below). If you purchase a whole bird from a reputable source, they often include the necks, gizzards, heart, liver, and sometimes feet within the cavity. These parts are often used in making a delicious homemade gravy or bone broth. Any of these parts un-cooked can be fed as is to your cat or dog. However, once cooked, I would only feed the organ meats chopped up and in small amounts, storing the remaining amount in your refrigerator. Organ meats are great sources of amino acids such as taurine, as well as trace vitamins and minerals. The longer the organ meats are cooked, they more deficient in nutrients they become. We prefer and suggest raw but, let’s face it, some animals are just finicky and prefer you to make them a home-cooked meal. AVOID: It is best to avoid giving any part of the cooked bird (other than muscle meat) to your pet. The skin is often fatty which could lead to an acute pancreatitis attack, vomiting, and diarrhea. The cooked bones are not digestible and could cause harm to the intestinal tract from getting stuck or perforating the gastrointestinal tract wall. If you are the ambitious type and make gravy from your drippings I would also avoid this for your dog and cat because of the added fat. Better tp be safe than sorry. Pumpkin is one of the best items to have in your house for your cat or dog. Pumpkin is full of vitamins and minerals that support their health. It is low protein, low fat, high fiber to help support your pet's digestion. If making a pie from scratch, dogs are willing to eat the flesh, skin, and pureed types from this hardy winter squash. Cats often like their pureed pumpkin hidden in canned or raw food. If you take the easy way out and purchase canned pumpkin, it is best to avoid the pumpkin pie filling as it has additional spices that may not agree with your pets delicate digestive tract. To read more about the health benefits of pumpkin, click here. AVOID: Pumpkin pie filling could upset your dog's gastrointestinal system because of the added spices. The pie crust could also add inflammation to the intestines as flour or wheat products could increase inflammation or acid reflux. Plus if the crust is homemade with lard, it may cause extra stress on the pancreas. 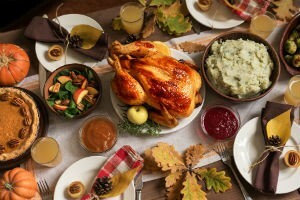 Additional items that might be around the house or on the table within your pets reach that you should avoid are: chocolate candies, sugary desserts, bread dough, alcohol & beer, potato skins, raisins, grapes, walnuts, macadamia nuts, nutmeg, cinnamon, sweeteners with xylitol, and ham bones. Here’s the tricky part… is your family, both immediate and extended, on board with what to feed and not feed your dog during the holiday party? If there is someone in the family that doesn’t adhere to the table feeding rules, then it might be best to remove your pet from dinner hour. This might be a good time to crate them in a room away from family or feed them that raw turkey neck to keep them busy. This can also reduce the stress on the hostess and avoid any late-night emergency clinic trips from your cat or dog becoming ill. We always recommend having activated charcoal at home for that just in case moment that your dog did happen to eat something they shouldn’t have. From our holiday dinner to yours… have a fun, safe, happy holiday.